Raging Kosi waters surrounded Ramnarayan Rai for 12 days in Madhepura's Batona village. Holed up in his house, he watched his younger brother, a youth of 28, waste and die of hunger. Two days after the death, his courage gave way when the body started decaying. He lit a matchstick and placed it on the lips of his dead brother--symbolic of Hindu funeral--and threw the body in the river Kosi--Sorrow of Bihar. In neighbouring Purnia district at Dhamdaha a marooned family tied a few handfuls of rice in a piece of cloth and dipped it in muddy water. At night they took it out and the whole family chewed the swollen rice. They survived but by the time they were rescued they were diarrhoea-ridden. Since the Kosi breached its eastern embankment at Kusaha in Sunsari district of Nepal on August 18 and flooded northern Bihar, rescue and relief work has been slow and tardy. Thousands of Ramnarayans are abandoning hope and thousands of families are fighting starvation and disease. A hundred people have died, about three million have been rendered homeless and a thousand are missing in Bihar. Another 35,000-odd people became homeless in four panchayats of Nepal. These are only official estimates; the actual figures could be many times. Besides, 1 million cattle are suspected to have perished and 125,000 hectares of agricultural land damaged. Unofficial reports estimate the agricultural loss at Rs 150 crore. It was a flood on biblical scale 979 villages in 34 blocks in five districts--Madhepura, Araria, Saharsa, Purnia and Supaul--were under 6-10 feet water for over a fortnight. Bursting through the embankment, the Kosi has created a water mass that is 150 km long and 36 km wide. It looks like a distributary branching off at the breach point. The areas under water are those that normally do not get inundated--the Kosi has changed its course. So the people were caught unawares. The authorities knew of the possibility of a breach in the embankment but did precious little to prevent it (more on this later in the story). Nor did they prepare a back-up plan to manage the impending disaster. The state government took four days to understand the catastrophe. Prime Minister Manmohan Singh was shocked when he did an aerial survey of the flood-affected areas on August 28 and released Rs 1,010 crore for relief. That was 10 days after the floods. Till then there was virtually no relief and rescue operation in the state; it went into full swing only after the army and navy were called in on August 27 and 28. In the first week of floods, Bihar administration struggled to procure boats and only two helicopters were providing relief. By the time the state government started the rescue operation 890 villages were inundated. Chief Minister Nitish Kumar nearly admitted that rescue and relief were a tough task. "The impact of flood cannot be contained by just rescue and relief operations; it is beyond that. The state will have to carry out operations in three phases because of the massive devastation," he said. 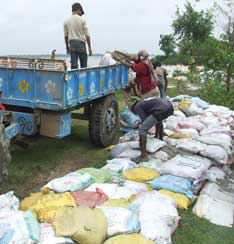 Relief work was so slow that the national disaster management, army, air force and navy could distribute only 0.15 million food packets in a fortnight. Pratyaya Amrit, additional commissioner, Disaster Management Department, Bihar, told Down To Earth (dte) on September 2, "Around 50,000 food packets have been air-dropped and more are being reached to the stranded people through boats and being distributed in relief camps." The first batch of the National Disaster Response Force (ndrf) did reach flood-hit areas on August 18 but its operations remained limited because of submerged rail and road links and incessant rains. It was only after August 28 that 1,400 boats and 11 helicopters were pressed into service. 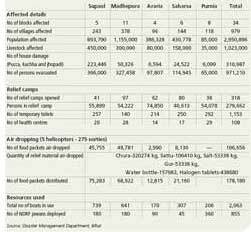 Armed forces have brought in 583 boats (see table). Supaul, 12 km from the breach site, was the first district in Bihar the Kosi swept through, leaving the chief engineer's office at Birpur, which monitors the Kosi barrage and embankments, in more than seven feet water. "Supaul was considered a safe zone after the embankments were built, hence except for a few villages inside the embankment, the people do not know how to tackle floods," says Chandrashekhar who runs Gramsheel, an ngo that works on water-related issues in the district. Yet no advance warning was issued to the people, says Ram Ishwar Prashad, deputy collector, Supaul. Along with hunger the people are now fighting diarrhoea. According to Chandrashekhar, nearly 100 people have died of diarrhoea in Supaul. Madhepura, which never witnessed floods except in Alamnagar, Chausa and Purnaini blocks, is worst-hit, with more than a million struggling for food. Army reached here only on August 26. In Mirganj and Rampur people died of hunger. "We have confirmation of 14 deaths. These could be hunger deaths but at this point of time we are focusing on relief and rescue. Work is a bit slow because it's a district that never faced floods," said sub-divisional officer Dharmendra Singh. Besides logistics, people's reluctance to leave homes also hampered rescue work. "People fear their goods and cattle will be stolen. They think this is yet another flood and water will recede in a few days. They are unaware of the breach," says Amrit of the Disaster Management Department. Several people have taken shelter at Raniganj on the Indo-Nepal border. Until September 3, no food or tarpaulin sheets were provided to these people by either the Nepal or the Bihar government. When dte reached there, most had covered their houses with either blanket or saris. Some had gone to the Kosi barrage to beg for food. Pawan Kumar Mandal of Basantpur, Supaul, who reached there on August 24, says nobody from the government came to help them. He had sent a member of his family to beg at the barrage. Across the border at Kunoli in Nepal, a boy walked along the Kosi Barrage, his hands tucked into his T-shirt, a dazed look on his face. He was almost run over by a vehicle. Was he a survivor of the floods? He stared back in silence. A little prodding and he said he was Ashok Kumar Mishra of Birpur in Supaul who crossed the border after eight days of wait for rescue. In his T-shirt were a handful of rice flakes he was taking for his mother. Father? Washed away by floodwater. Some 500 families had crossed the border in hope of succour but have not received anything except tarpaulin sheets. On September 4, their anger spilled over and they blocked Mahender Rajmarg, Nepal's main highway at Kanauli near Kosi Barrage, demanding food. Tajinder Singh and his family of five left their house at Birpur, Supaul, on August 24 in hope of getting relief. For almost four days they had nothing to eat except some rice flakes they had brought with them. Their neighbour Naina Singh, who had also migrated, said, "We are still waiting for relief agencies to distribute food to us." Some in desperation blocked a un truck even as representatives tried to convince the crowd that some food would be given to them in a few hours. The displaced Nepalese, however, got a better bargain. 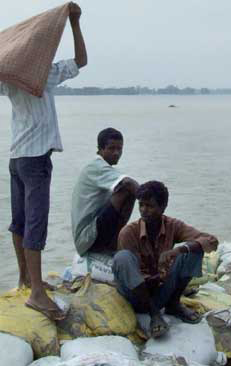 Near the Kosi barrage, some 6,000 families were living in temporary hutments. International agencies, including un's World Food Programme, msf, Oxfam and International Red Cross, were working. Most families from Nepal have been provided basic ration to survive for at least 15 days. The Nepal army is holding medical camps for flood victims. Temporary relief camps in Bihar in the first few days only gave shelter; they did not provide food. Those who brought goats, hens and calves on their shoulders were bartering them for food. There was no arrangement for cooking as firewood was in short supply. Although food supplies were restored after a fortnight, hygiene deteriorated. Scores of people were rushed to hospitals after being infected with water-borne diseases. There was oversupply of old clothes, which people sold in the market to get milk for babies and food. The situation improved only when big relief camps began to be converted into permanent camps after August 28 and toilets were constructed. On September 5, the centre despatched a high level medical team to assess the situation. Union health secretary Naresh Dayal said the Centre had also mobilized six public health teams and 10 medical teams which would be sent when the state demands. Till September 10, Bihar had not asked for these medical teams. "The state had demanded 37 drugs of which 20 have been procured while orders have been placed for the remaining 17. We are also going to send Japanese encephalitis vaccines procured from China," Dayal added. Twenty million chlorine tablets for water purification and 0.63 million doses of measles vaccine had also been despatched to the state capital Patna, informed Dayal. He added that fogging machines and disposable syringes were being procured to prevent an outbreak of vector-borne diseases.Though no cases of measles and Japanese encephalitis were reported by the first week of September, diarrhoea and dehydration were widespread. Supaul's Deputy Collector (administration) Rameshwar Prasad, who is manning Bais RD camp on the eastern canal of the barrage, confirmed rising cases of diarrhoea in flooded areas. "But diarrhoea deaths don't reflect in the Bihar government's statistics," said Chandrashekhar of Gramsheel. Kamlesh Prasad Singh of Birpur who had stayed at the Bais RD camp for eight days, said there were only two doctors posted for about 2,000 families in the camp. People were falling ill because of inadequate drinking water facilities. When dte visited relief camps pregnant women were delivering without medical help (see Delivery in floods). Some delivered stillborn babies. There were medicines but no doctors. Social activist Medha Patkar had to fight for the treatment of a pregnant woman who delivered a stillborn baby at Saharsa Sadar Hospital. "Newborn babies are at the mercy of God. Not a single doctor has visited them. My wife is writhing in pain," said Birender Narayan Singh at the Banmankhi relief camp. Aid is trickling in from states and humanitarian agencies. 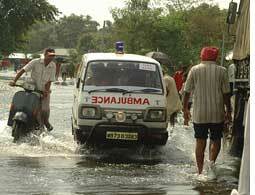 Gujarat and Andhra Pradesh have despatched ambulances. Three mobile medical units moved in from Jharkhand, while two others were sent from Assam. The Gujarat Cooperative Milk Marketing Federation has chipped in with infant food. The Indian Red Cross Society has supplied material of daily requirement. In collaboration with Nestle it also provided Maggi noodles for relief camps, which raised some eyebrows. Amid the tragedy, political blame game raged on. Union Railway Minister Lalu Prasad Yadav criticized Bihar for not providing enough rescue and relief to the people. Kumar in turn accused Lalu of bullying officials. "He is scolding and forcing senior officials to set up relief camps in Patna. He's also hampering relief work by visiting flood-affected areas and creating chaos," he said. "There are problems but these will be sorted out," said Deputy Chief Minister Sushil Kumar Modi. The state government has chalked out a three-phase strategy of relief, resettlement and rehabilitation. The second phase involves converting mega camps into permanent camps for at least six months. In the third phase Bihar, with Centre's help, will distribute seeds and rebuild irrigation facilities. On September 7, the Bihar government said that the stranded had been evacuated and phase II of relief operations would begin. It is easier said than done. Civil society organizations feel there should be guidelines for shelter, health, water, sanitation, hygiene, community kitchen and telecom connectivity. "Diseases will become a major challenge as soon as the water recedes. There will also be waterlogging," says Eklavya Prasad of Megh Pyne Abhiyan, a network of organizations working on water-related issues in Bihar. It will take at least one month for water to completely recede. The state Disaster Management Department is fearing that once the water dries up, it will throw up cattle corpses. "The threat of epidemic looms large and the army, along with the disaster management force, will have to work for another month to complete phase II. We have pleaded to corporate houses to provide galvanized iron sheets for making camps," said Nitish Kumar. Social organizations and donors are sending food material, cloth, medicine and cash but there is no sign of epidemic-fighting material. "There is a dire need for firewood to bury or cremate bodies. Procuring firewood locally is impossible, so we will have to transport it. But helicopters are still busy in transporting relief material to the camps. Around 5,000 km of roads have been damaged, so transporting firewood will time-consuming. In a week epidemic is likely," said a government official. Social workers like Kavindra Kumar Pandey of the Patna-based Centre for World Solidarity says once water recedes, there would be an urgent need for rehabilitation. "There should be a trauma centre in every relief camp. Special care should be taken of young women, adolescent girls, widows and infants since human trafficking surges after such disasters," says Pandey. The other challenge will be locating the missing. The state government has announced a compensation of Rs 1 lakh to relatives for every loss of life. Officially, the compensation should reach the victims within a month but there is a catch. "Most of the bodies would have been swept away in floods. 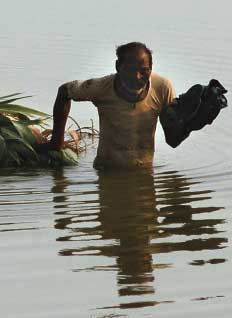 There are many who do not know if their missing relatives are dead or alive," says Jitender Kumar, member of a Sitamarhi-based ngo Navjagriti that works with the flood-affected. The chief minister claimed 300,000 people were in relief camps. Mass exodus of families has left behind 900 ghost villages. Overcoming loss of crops and cattle, repair of roads and rehabilitation of three million flood-affected will require a huge effort and funds. Unofficial estimates claim Bihar's development has been set back by five years and more than Rs 5,000 crore are required to rebuild the devastated areas. The Bihar government had requested the Centre for Rs 3,000 crore but got Rs 1,010 crore. Nitish Kumar has promised that each girl child born in relief camps would be given Rs 11,000 and a boy, Rs 10,000. It is welcome. But what about the emotional scars suffered by three million people? The Kosi breach was not something the Bihar and Union governments were unaware of. Official sources reveal that both governments may have known about the weak point in embankment in Kusaha, as early as August 5. Every year before the onset of monsoons, engineers of the state Water Resources Department carry out anti-erosion work, where weak spots in the embankments are identified and repaired. Once the monsoon sets in, the engineers have to monitor the embankment and see if any fresh area is getting eroded, explains an official of the department. Anti-erosion work this year was completed by June 12 in accordance with the Kosi High Level Committee's recommendations made on October 27 last year. The committee, a multilateral body with members from India and Nepal, had recommended repair of spurs at nine places on the eastern embankment, including the 12.10 km and 12.90 km marks. Bihar government sent a project completion report to the Union government in the second week of June. About Rs 1.90 lakh was provided for the repair of the 12.10 km point, which is less, said the official. In the third week of June the department reviewed the anti-erosion work and knew that 12.10 km point was the weakest link in the embankment. Officially, the flood protection work on the embankment started on August 5. On observing an erosion at the point, chief engineer of the Kosi project--that monitors the barrage, embankments and canals--E Satyanarayanan, who was stationed in Birpur, Supaul, sent a message to Kosi Liaision Officer Arun Kumar Singh in Kathmandu, on August 5. Singh was on leave. Satyanarayanan claimed that between August 9 and August 17, a day before the breaching of the embankment, he had sent four more emergency messages to the state government over the possibility of breach at location 12.10. First letter was faxed on August 9, second on August 14, third on August 15, and when he got no response, he sent a telegram. The fax connection at Kumar's office was disconnected due to non-payment of bills. Even the isd connection at the Birpur office was withdrawn because phone bills were not cleared. So it seems the chief engineer's missives were not received. Yet the Bihar government probably knew of the erosion, for the state Water Resources Department sent the chief engineer of Birpur, along with a former engineer of the department, Brijnandan Prasad, to asses the situation and take necessary measures on August 16, according to a source in the department. The department was also in touch with the Indian embassy in Nepal for providing security to the contractor who was repairing the breach. Finally, Chief Minister Nitish Kumar called up External Affairs Minister Pranab Mukherjee to persuade the Nepalese government to help repair the damaged embankment. Official documents in possession of dte reveal that the Bihar government was receiving conflicting reports about the weakening of the eastern embankment. The Central Flood Control Room in its bulletins on August 16 and 17 said, "All the embankments under the Water Resources Department are safe". In fact, the state department prepared an interim report on August 16, which said the flood situation was under control. On September 7, Nitish Kumar said he was not aware of the gravity of the situation as his Water Resources Department had told him that the flood was of a regular kind. However, a senior official of the department said the chief minister was aware of the situation by August 17. When the external affairs ministry and the Indian embassy in Nepal failed to persuade the Nepalese administration to provide security, Kumar called a political friend who was present at the swearing-in ceremony of Nepal Prime Minister Pushpa Kamal Dahal (Parchanda). He requested his friend to apprise Parchanda of the situation, according to the official. After the ceremony Parchanda gave the orders to give security to the Bihar engineers. Deputy Chief Minister Sushil Kumar Modi, however, claimed that the chief minister had written to Mukherjee on August 19, and that the centre was informed of weak embankment on August 5. "We requested the centre to hold talks with Nepal but were told that since there was no government there it would be difficult to communicate," Modi said. The centre accused the state of neglect. Jai Prakash Yadav, minister of state for water resources, told dte, "The maintenance and repair work of the Kosi barrage was to be completed by April 15. The state government was in deep slumber till June to prepare an estimate of cost of maintenance work." Whoever may have been responsible, the embankment gave way. On August 18, the Central Flood Control Room in a letter informed the state government that spurs protecting embankments had been breaching at 12.10 and 12.90 km for the past few days. "The regional engineer was trying to mend the damage. On the night of August 17, unsocial elements whisked away labourers and officials of the department, resulting in the breach. Flood control material that was rushed could not reach the breach site because of stampede created by Nepalese locals. It has resulted in the leaking of water towards Birpur," stated the letter. According to a former chief engineer posted at Birpur, the relationship between the engineer and the Nepalese contractors and labourers is difficult to manage. "Kosi Barrage is the only development project in that area, so there is a lot of pressure from both local contractors and labourers," he said. A source at the barrage said the Bihar government had not paid about 2,000 labourers. Durgananda Jha, a contractor based in Hanuman Nagar, the barrage site, said he was not paid any money for a work on embankment in 1998. Many officials, however, suspect the security threat was a last-minute excuse rustled up by the state Water Resources Department to escape blame. The Bihar government has ordered a judicial inquiry into the breach, which will have to submit its report in six months. At present, the bigger worry is when will the breach get repaired? 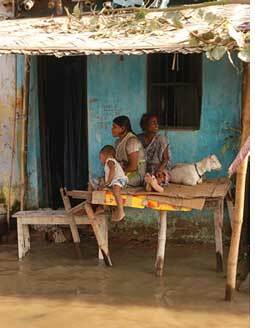 Swollen by the retreating monsoon, the Kosi floods again in mid-October. According to officials manning the Kosi barrage, the repair work was shoddy. All this while the breach was expanding. The 400 m breach at 12.10 km point extended up to 1.7 km by August 28. The state government set up the Kosi Breach Closure Advisory Team of engineers on August 28, which found massive irregularities during its visit to the breach site on August 31. In its report, the team mentioned that the progress of armouring cut ends (the eroding end) was unsatisfactory and adequate boulders were not dropped at the site to control the breach. "Only two truckloads of boulders were unloaded. We were apprised that 20 truckloads have been dropped," the report stated. The report also revealed absence of high-capacity boats on the site to deliver crates and sandbags to the northern side of the embankment. "Low power boats cannot move in the high spate of the river," it mentioned. The report recommended that the state government should initiate work on war-footing and urgently procure equipment. The team also called for completing the repair work before October. On September 3, when dte visited the breach site, work was on at a snail's pace. Site engineer Roshan Sharma of Hindustan Steel Construction Company, entrusted with repair of the breach, informed that they had started work on August 30. He said almost 50 trucks had delivered nylon crates to the site. A crate contains close to 25 nylon bags containing sand, which are put in a nylon mesh and dropped to protect the cut ends. The crates are covered with boulders to arrest erosion. However, the site had far fewer than 125,000 bags as the engineer had claimed. Will the people again pay the price for governments' apathy or will governments learn lessons from the tragedy, only time will tell.